This 3 day camel trek in the Sahara Desert in Morocco will take you into the heart of the Moroccan Sahara Desert. You will see Kasbahs, orange sand dunes large and small, oases, distant mountain summits, the Valley of a Thousand Kasbahs, the ‘Moroccan Hollywood’ and sunrises and sunsets so beautiful you will never forget them. You will also spend your time riding camels which are the natural choice for riding through the arid beauty of the Moroccan desert. If you don’t have enough time for this 3 day Sahara Desert tour then we can offer you the choice of a 2 Day Sahara Desert tour or if you want to spend more time exploring this area then a 4 day Sahara Desert tour to Merzouga. Whichever tour you choose you will be accompanied by a guide and driver who will make sure that all your needs are met and provide you with information on all of the different places you will visit. Bringing your camera is essential as you will want to capture these memories to look back on when you go home. 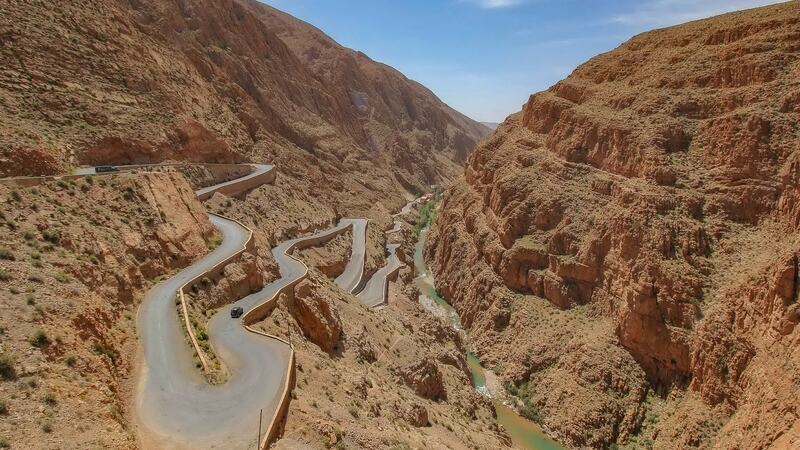 You will be met by your guide and driver in the morning to start the journey to the Moroccan south, crossing the High Atlas Mountain range via Tichka pass (2260m), which is considered the highest mountain pass in Morocco. Afterwards you will be driven along the Telouet valley, in the past the road used to be the only path for caravans coming from the Southern provinces to Marrakech. We will also pay a short visit to the Pasha Glaoui’s abandoned kasbah on the way to kasbah of Ait Ben Haddou. It has been one of the UNESCO world heritage sites since 1987 (movie fans: several Hollywood films were shot here). In the afternoon we will drive to Dades Gorges (valley of roses on the way) where will we will spend the night. After breakfast we will visit Dades Gorge, Todra Gorge (lunch). Afterwards we will drive onwards passing through many Berber Villages, such as Arfoud and Risasani Towns, optional stops in Arfoud to visit the big fossil factories. When we arrive to Merzouga, camel ride to arrive at the nomadic camp in Erg Chebbi. Waking up early to enjoy sunrise, then we will ride camels to Merzouga. Afterwards we will pass through Alnif, Tazzarine & along the Draa valley before arriving to Agdez and then continue to Marrakech via Ouarzazate where we will stop for lunch.